We're looking at what's undoubtably going to be a big upcoming year for Marvel's movies. But, while the theater screens may have our focus for now, the most interesting transformation may actually be brewing somewhere else: Television. In response to this piece on how 2015 could be the biggest building year in the Marvel Cinematic Universe since Iron Man kicked off in 2008, a discussion began about some of the different ways the year could unfold. On the television front there's also Agent Carter and Marvel's Daredevil and Marvel's A.K.A. Jessica Jones. These three also produce risks and and possible rewards for Marvel. Agent Carter: The main risk is that if it's awful it could scare ABC viewers off from wanting anything more to do with Agents of S.H.I.E.L.D. Like viewers could turn in to watch Agents, find this, hate it, and then not return to Agents when it returns. (I don't think this is a very likely risk). 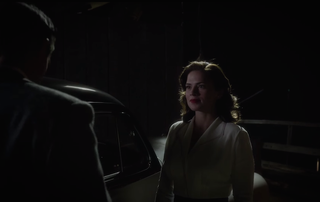 The possible rewards are that it gets to fill more of the 1940s backstory of the MCU in for the audience, making that time a viable time to put further productions in, it has a leading woman in a television series and finally gets to hold that over the heads of DC's modern television series, and it could help build the audience for Agents. Marvel's Daredevil: it's risky because most of the people who saw Daredevil are still alive and that film did not make everyone happy. It's potentially very rewarding because Daredevil is an interesting character in and off himself and he has a lot of interesting characters associated with him and well basically if that show works than the other Marvel Netflix shows increase their odds of working. Marvel's A.K.A. Jessica Jones: it's risky because only comic book fans know who Jessica Jones is. But it's rewarding because it once again expands the range of what MCU properties can be. A show in the MCU about a private eye adds another layer onto the complex world that the MCU wants to be. And it's once again rewarding because, like Agent Carter, it features a leading woman in a television series and once again gets to show that the MCU is at least trying to diversify itself a bit. Another thing that could be key with Agent Carter is it could play a big role in setting up Hank Pym if the show introduces the younger version of him towards the end with a flash forwards to later decades. It would go a long way towards setting the backstory for the Ant-Man movie. Not only that, but if they delve into the killing of Stark's parents by Hydra in Agent Carter, as told in Cap 2 - that could set up Stark's platform for Avengers 2, and Cap 3. Definitely! I really hope Agent Carter is successful. If it is, maybe we'll be lucky enough to get a full blown Carter series. If not, then maybe the 'mid-season mini-series' format would fit nicely with other MCU characters. Maybe an 8 episode series dealing with Trevor Slattery's tomfoolery with the actual Mandarin. Maybe War Machine gets the spotlight for a bit. Make a Squirrel Girl mini-series and Marvel will have my unending love forever and ever amen. Yes, let's definitely not forget the Netflix shows! I'm so looking forward to those. I think AKA will be an interesting show that will have to diverge from the comics regardless, so it's going to be new ground for everyone. Because a main factor of Jones' origin (and the whole point of "AKA") was her being a former member of the spandex set. The MCU doesn't have a spandex set the way the comics do. So I'm very curious to learn how they translate that. Do you have your own thoughts on how the new television properties could play with (or against) their bigger screen counterparts? And what are some of the stories you hope to see play out on television, that wouldn't work as well in the movies? Tell us about it in the comments.